No more fuzzy "copy & paste" images in your documents or on your Web site! pdf2image converts Adobe Acrobat PDF files into high-quality JPEG, PNG, GIF, BMP or TIFF images for use on the Web or in Microsoft applications such as Word, Publisher, PowerPoint, Excel, Visio and FrontPage. pdf2image can also be used to import batches of images, music or other documents into your applications or for upload to sites such as Facebook or LinkedIn. 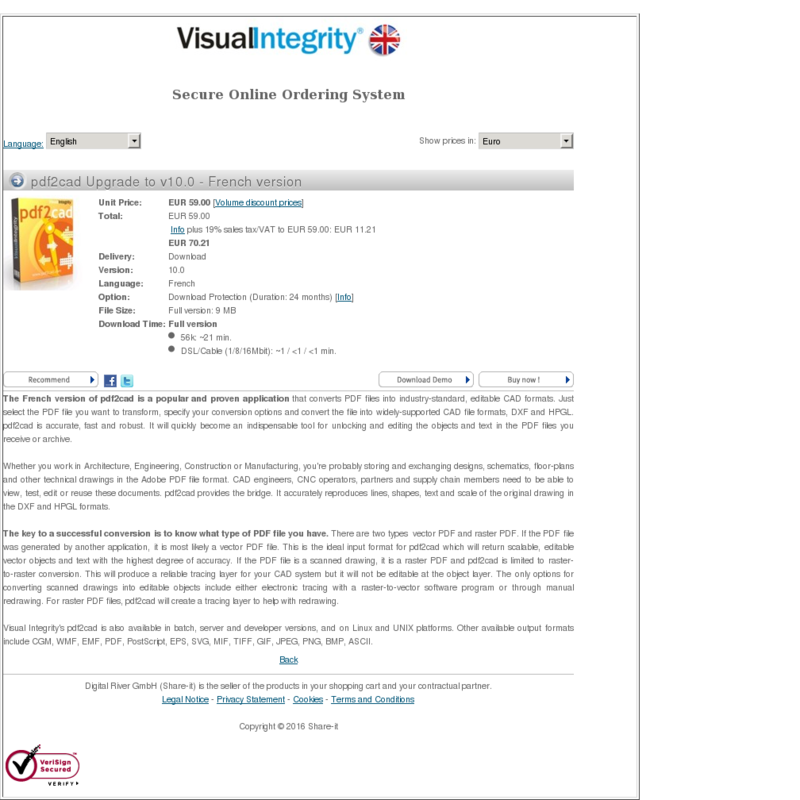 pdf2image is perfect for people creating newsletters, bulletins, datasheets, brochures and more. It is an easy two-step process. Just select your file, choose the resolution and format options and then convert. The results look great both at the lower screen resolutions required for Web display and at high resolutions for printing. Version 8.0 supports batch mode for quick conversion of multiple files or directories. It also adds TIFF as a new output choice. 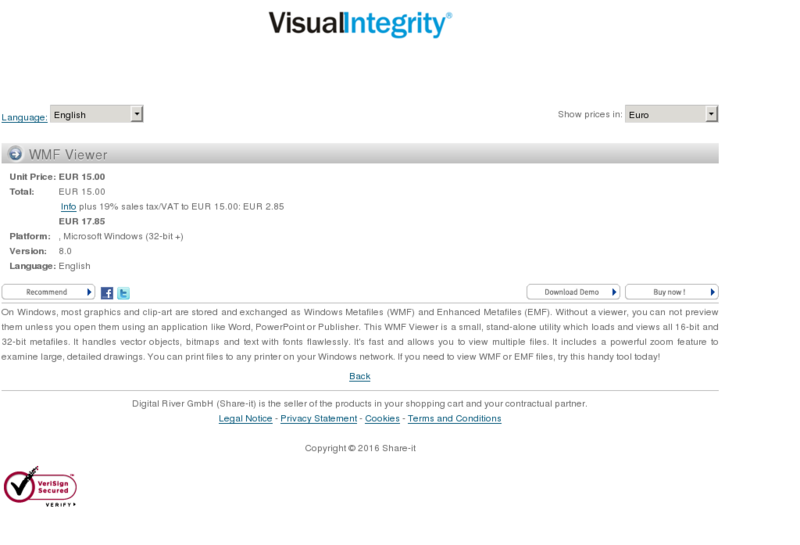 Supports Windows Vista as well as XP, and older 32-bit versions of Windows. 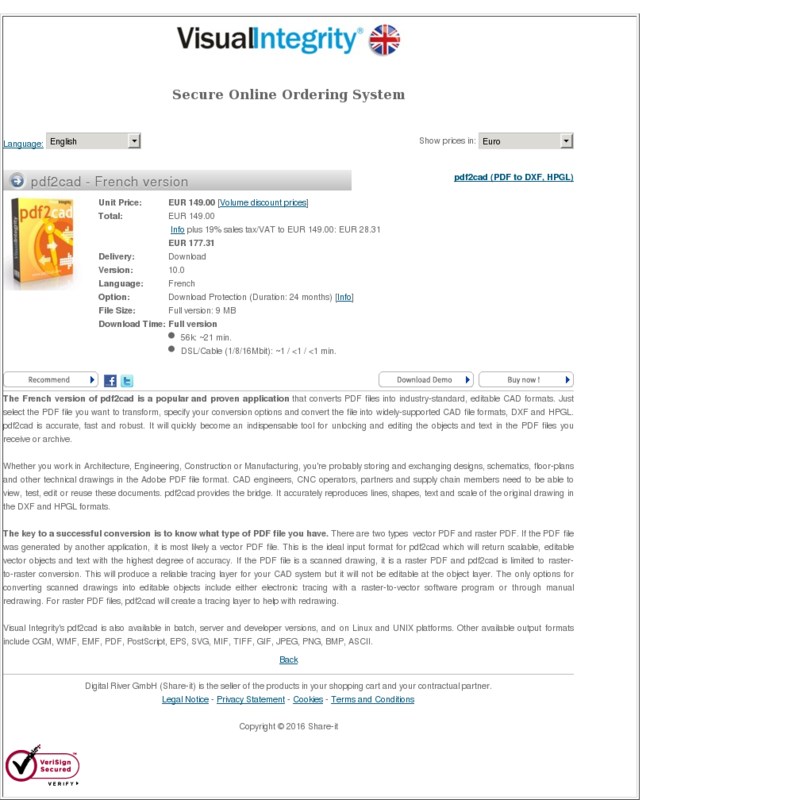 For 17 years, Visual Integrity has been leading the way with easy yet accurate conversion solutions for small business and large organizations alike. 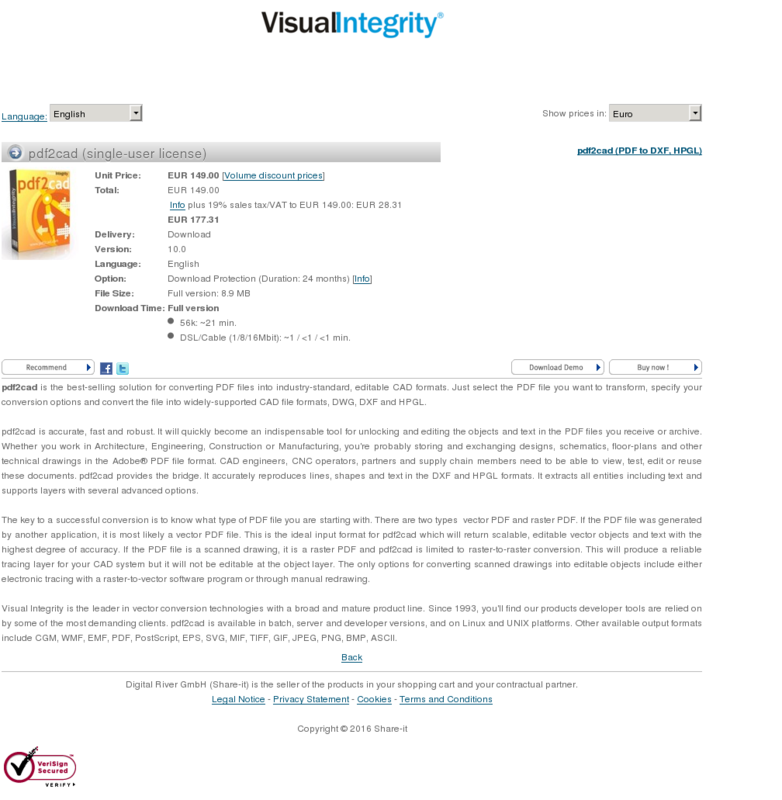 Try pdf2image today! .ini configuration file allows for custom defaults. The French version of pdf2cad is a popular and proven application that converts PDF files into industry-standard, editable CAD formats. Just select the PDF file you want to transform, specify your conversion options and convert the file into widely-supported CAD file formats, DXF and HPGL. pdf2cad is accurate, fast and robust. It will quickly become an indispensable tool for unlocking and editing the objects and text in the PDF files you receive or archive. Whether you work in Architecture, Engineering, Construction or Manufacturing, you’re probably storing and exchanging designs, schematics, floor-plans and other technical drawings in the Adobe PDF file format. CAD engineers, CNC operators, partners and supply chain members need to be able to view, test, edit or reuse these documents. pdf2cad provides the bridge. It accurately reproduces lines, shapes, text and scale of the original drawing in the DXF and HPGL formats. The key to a successful conversion is to know what type of PDF file you have. There are two types  vector PDF and raster PDF. If the PDF file was generated by another application, it is most likely a vector PDF file. This is the ideal input format for pdf2cad which will return scalable, editable vector objects and text with the highest degree of accuracy. If the PDF file is a scanned drawing, it is a raster PDF and pdf2cad is limited to raster-to-raster conversion. This will produce a reliable tracing layer for your CAD system but it will not be editable at the object layer. The only options for converting scanned drawings into editable objects include either electronic tracing with a raster-to-vector software program or through manual redrawing. For raster PDF files, pdf2cad will create a tracing layer to help with redrawing. 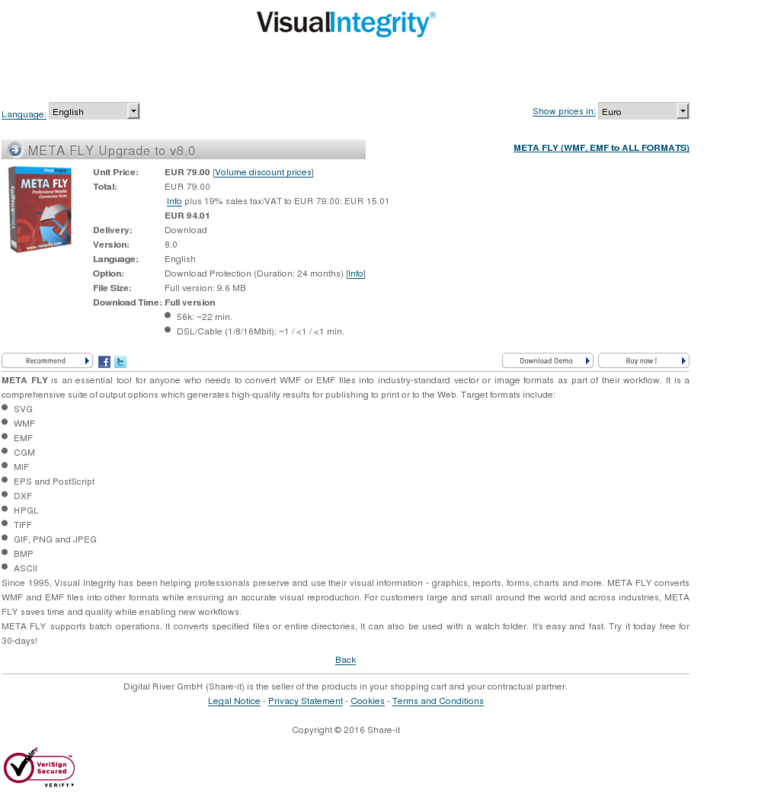 Visual Integrity’s pdf2cad is also available in batch, server and developer versions, and on Linux and UNIX platforms. Other available output formats include CGM, WMF, EMF, PDF, PostScript, EPS, SVG, MIF, TIFF, GIF, JPEG, PNG, BMP, ASCII. The pdf2cad Home/Office License it designed for users who need to use the software in two locations, usually one at work and one at home or on the road. pdf2cad converts PDF files into industry-standard, editable CAD formats. Just select the PDF file you want to transform, specify your conversion options and convert the file into widely-supported CAD file formats, DXF and HPGL. pdf2cad is accurate, fast and robust. It will quickly become an indispensable tool for unlocking and editing the objects and text in the PDF files you receive or archive. 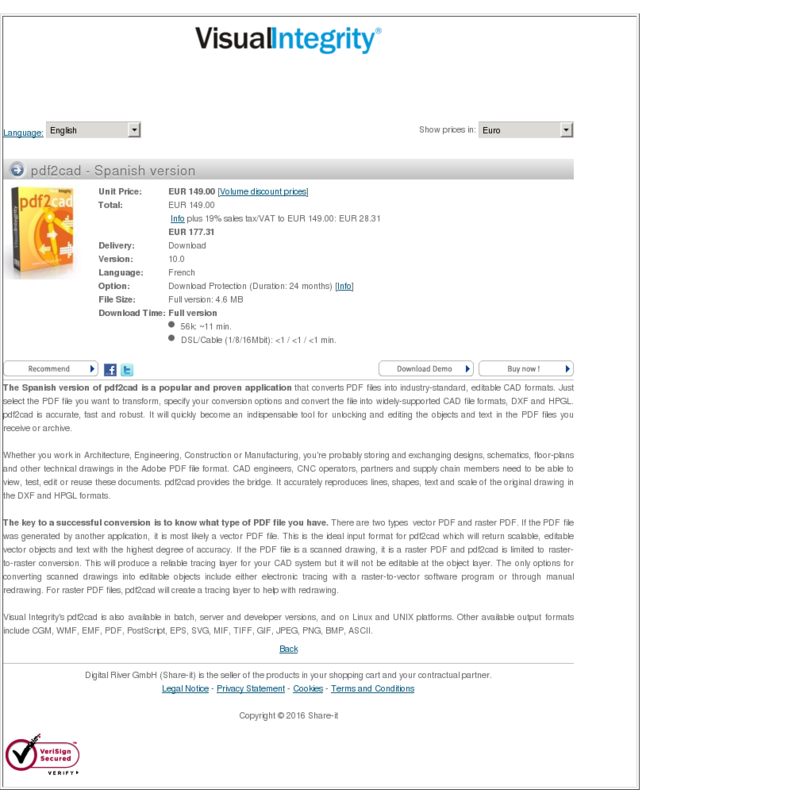 Visual Integrity’s pdf2cad is also available in batch, server and developer versions, and on Linux and UNIX platforms. Other available output formats include CGM, WMF, EMF, PDF, PostScript, EPS, SVG, MIF, TIFF, GIF, JPEG, PNG, BMP, ASCII. pdf2cad Home/Office is a popular and proven application that converts PDF files into industry-standard, editable CAD formats. Just select the PDF file you want to transform, specify your conversion options and convert the file into widely-supported CAD file formats, DXF and HPGL. The Home/Office license is for users who need to use it in the office as well as at home or on a laptop. It is licensed for use by one user in two locations (Home/Office). pdf2cad is accurate, fast and robust. It will quickly become an indispensable tool for unlocking and editing the objects and text in the PDF files you receive or archive. Whether you work in Architecture, Engineering, Construction or Manufacturing, you’re probably storing and exchanging designs, schematics, floor-plans and other technical drawings in the Adobe® PDF file format. CAD engineers, CNC operators, partners and supply chain members need to be able to view, test, edit or reuse these documents. pdf2cad provides the bridge. It accurately reproduces lines, shapes and text in the DXF and HPGL formats. The key to a successful conversion is to know what type of PDF file you are starting with. There are two types  vector PDF and raster PDF. If the PDF file was generated by another application, it is most likely a vector PDF file. This is the ideal input format for pdf2cad which will return scalable, editable vector objects and text with the highest degree of accuracy. If the PDF file is a scanned drawing, it is a raster PDF and pdf2cad is limited to raster-to-raster conversion. This will produce a reliable tracing layer for your CAD system but it will not be editable at the object layer. The only options for converting scanned drawings into editable objects include either electronic tracing with a raster-to-vector software program or through manual redrawing. pdf2cad konvertiert vektorbasierte Adobe PDF Dokumente aus technischen Zeichnungen in das DWG, DXF oder HPGL Format. 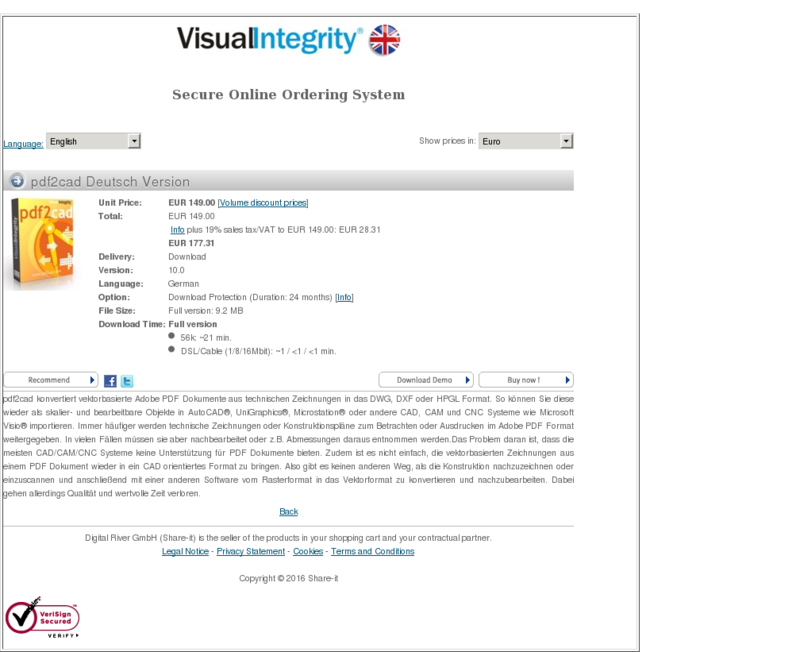 So können Sie diese wieder als skalier- und bearbeitbare Objekte in AutoCAD®, UniGraphics®, Microstation® oder andere CAD, CAM und CNC Systeme wie Microsoft Visio® importieren. Immer häufiger werden technische Zeichnungen oder Konstruktionspläne zum Betrachten oder Ausdrucken im Adobe PDF Format weitergegeben. In vielen Fällen müssen sie aber nachbearbeitet oder z.B. Abmessungen daraus entnommen werden.Das Problem daran ist, dass die meisten CAD/CAM/CNC Systeme keine Unterstützung für PDF Dokumente bieten. Zudem ist es nicht einfach, die vektorbasierten Zeichnungen aus einem PDF Dokument wieder in ein CAD orientiertes Format zu bringen. Also gibt es keinen anderen Weg, als die Konstruktion nachzuzeichnen oder einzuscannen und anschließend mit einer anderen Software vom Rasterformat in das Vektorformat zu konvertieren und nachzubearbeiten. Dabei gehen allerdings Qualität und wertvolle Zeit verloren. Save money with the 5-user Workgroup License. Available to be installed on either 5 PC’s or on a network share drive. Save 50%. pdf2cad is the best-selling solution for converting PDF files into industry-standard, editable CAD formats. Just select the PDF file you want to transform, specify your conversion options and convert the file into widely-supported CAD file formats, DXF and HPGL. pdf2cad is accurate, fast and robust. It will quickly become an indispensable tool for unlocking and editing the objects and text in the PDF files you receive or archive. Whether you work in Architecture, Engineering, Construction or Manufacturing, you’re probably storing and exchanging designs, schematics, floor-plans and other technical drawings in the Adobe® PDF file format. CAD engineers, CNC operators, partners and supply chain members need to be able to view, test, edit or reuse these documents. pdf2cad provides the bridge. It accurately reproduces lines, shapes and text in the DXF and HPGL formats. It extracts all entities including text and supports layers with several advanced options. 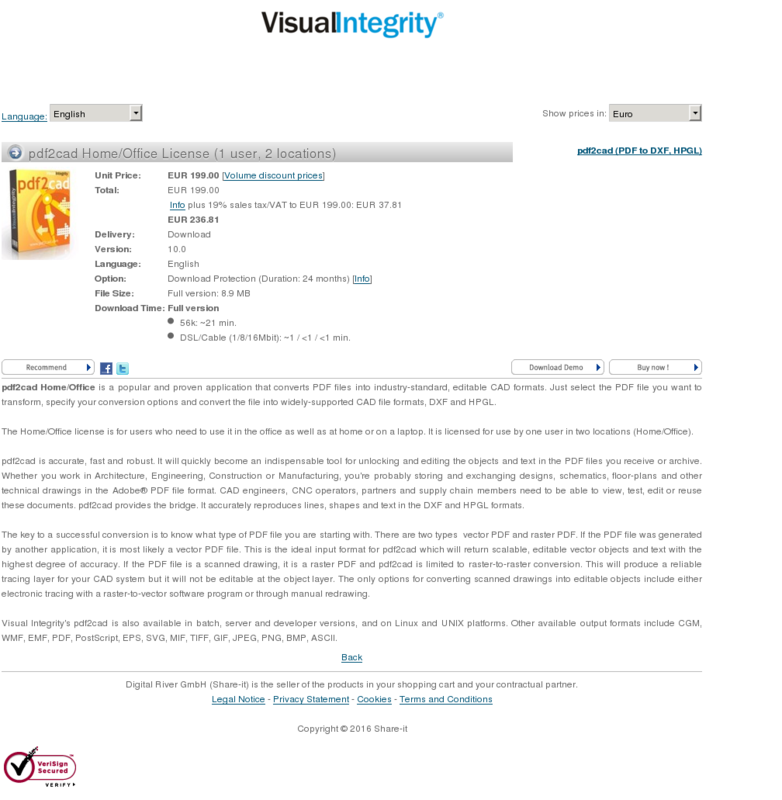 Visual Integrity is the leader in vector conversion technologies with a broad and mature product line. Since 1993, you’ll find our products developer tools are relied on by some of the most demanding clients. 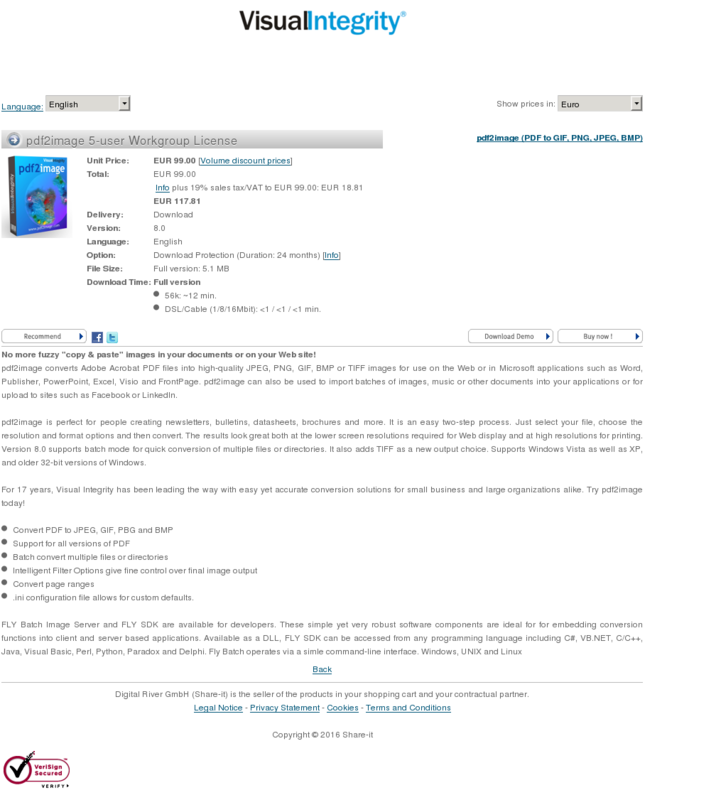 pdf2cad is available in batch, server and developer versions, and on Linux and UNIX platforms. Other available output formats include CGM, WMF, EMF, PDF, PostScript, EPS, SVG, MIF, TIFF, GIF, JPEG, PNG, BMP, ASCII. The Spanish version of pdf2cad is a popular and proven application that converts PDF files into industry-standard, editable CAD formats. Just select the PDF file you want to transform, specify your conversion options and convert the file into widely-supported CAD file formats, DXF and HPGL. pdf2cad is accurate, fast and robust. It will quickly become an indispensable tool for unlocking and editing the objects and text in the PDF files you receive or archive. pdf2cad is the best-selling solution for converting PDF files into industry-standard, editable CAD formats. Just select the PDF file you want to transform, specify your conversion options and convert the file into widely-supported CAD file formats, DWG, DXF and HPGL. On Windows, most graphics and clip-art are stored and exchanged as Windows Metafiles (WMF) and Enhanced Metafiles (EMF). Without a viewer, you can not preview them unless you open them using an application like Word, PowerPoint or Publisher. This WMF Viewer is a small, stand-alone utility which loads and views all 16-bit and 32-bit metafiles. It handles vector objects, bitmaps and text with fonts flawlessly. It’s fast and allows you to view multiple files. It includes a powerful zoom feature to examine large, detailed drawings. You can print files to any printer on your Windows network. If you need to view WMF or EMF files, try this handy tool today! Save money with the pdf2picture 5-user Workgroup License. pdf2picture is a handy and inexpensive application that transforms PDF into the formats that are ideally suited for use in Microsoft Office and other Windows applications. It operates in either vector or bitmap mode. Choose vector mode (WMF/EMF) to extract editable graphic objects and text which and then modify them in Word, Publisher, PowerPoint, Visio and other Windows applications. Bitmap mode generates high-fidelity images that you can insert into your documents or publish on your web-site. It’s the only PDF graphics converter that you will need. pdf2picture operates on any PDF file you receive. In no time, you’ll be including PDF illustrations or charts in PowerPoint presentations or modifying floor plans in Visio. You’ll save time previously spent manually redrawing these pictures. Try it free for 30-days! pdf2picture is a handy and inexpensive application that transforms PDF into the native Microsoft graphics formats. It operates in either vector or bitmap mode. Choose vector mode (WMF/EMF) to extract editable graphic objects and text which and then modify them in Word, Publisher, PowerPoint, Visio and other Windows applications. Bitmap mode generates high-fidelity images that you can insert into your documents or publish on your web-site. Its the only PDF graphics converter that you will need. Try it free for 30-days! pdf2picture operates on any PDF file you receive. In no time, you’ll be including PDF illustrations or charts in PowerPoint presentations or modifying floor plans in Visio. You’ll save time previously spent manually redrawing these pictures. pdf2picture will quickly and accurately convert your PDF files into the native Microsoft picture format (WMF) so you can edit both the objects and the text. The key to successful use of PDF in Windows applications is to know what type of file you have. There are two basic types  vector and raster, or bitmap. In vector mode, pdf2picture can extract the text and objects for further modification. In bitmap mode, it will transform both vector and raster PDF files into high-fidelity images to spice up your documents and presentations. With pdf2picture, you’ll add an invaluable tool to your work environment. Using it, you’ll be able to convert any PDF file that you receive into the most ideal format for Microsoft Office and other popular applications. pdf2picture is a handy and inexpensive application that transforms PDF into the formats that are ideally suited for use in Microsoft Office and other Windows applications. It operates in either vector or bitmap mode. Choose vector mode (WMF/EMF) to extract editable graphic objects and text which and then modify them in Word, Publisher, PowerPoint, Visio and other Windows applications. Bitmap mode generates high-fidelity images that you can insert into your documents or publish on your web-site. It’s the only PDF graphics converter that you will need. pdf2picture operates on any PDF file you receive. In no time, you’ll be including PDF illustrations or charts in PowerPoint presentations or modifying floor plans in Visio. You’ll save time previously spent manually redrawing these pictures. Try it free for 30-days! The pdf2AutoCAD App opens PDF files for editing within AutoCAD and other Autodesk programs. 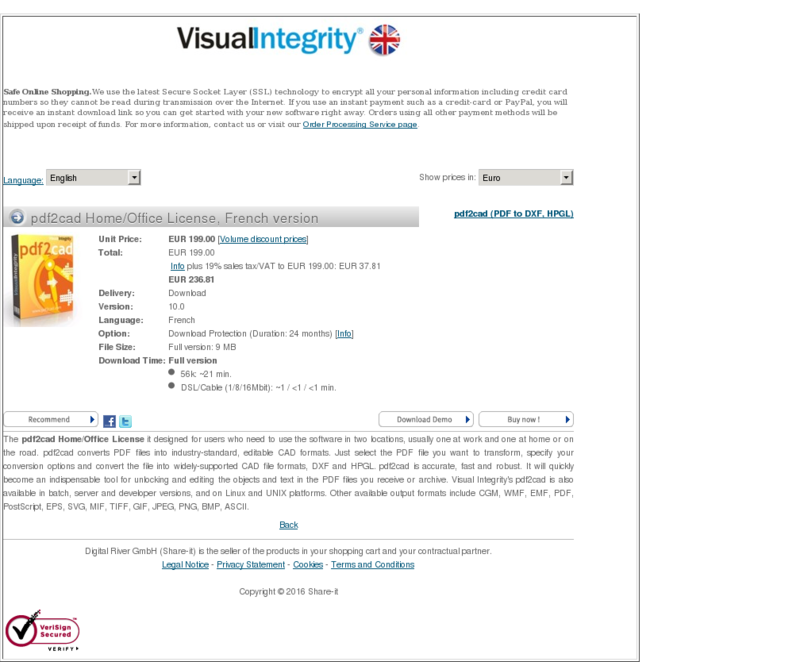 It’s not just another PDF Viewer or Underlay! It’s more. 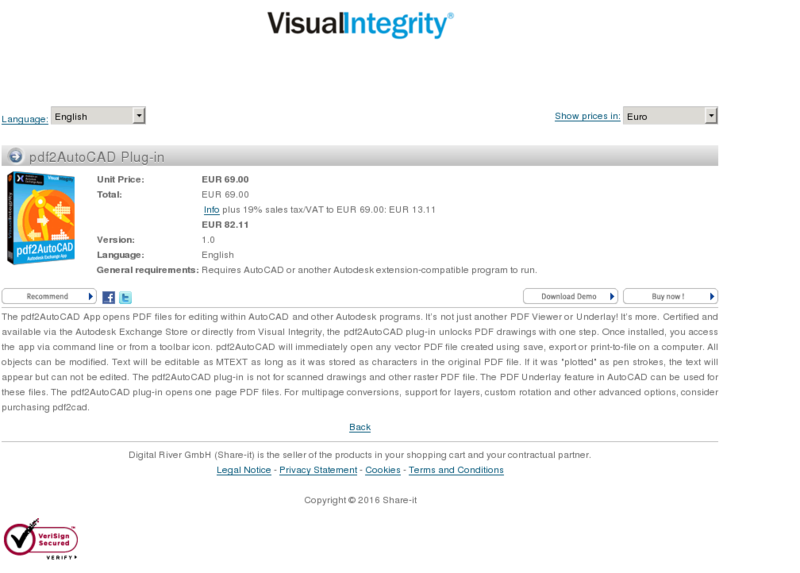 Certified and available via the Autodesk Exchange Store or directly from Visual Integrity, the pdf2AutoCAD plug-in unlocks PDF drawings with one step. Once installed, you access the app via command line or from a toolbar icon. pdf2AutoCAD will immediately open any vector PDF file created using save, export or print-to-file on a computer. All objects can be modified. Text will be editable as MTEXT as long as it was stored as characters in the original PDF file. If it was “plotted” as pen strokes, the text will appear but can not be edited. The pdf2AutoCAD plug-in is not for scanned drawings and other raster PDF file. The PDF Underlay feature in AutoCAD can be used for these files. The pdf2AutoCAD plug-in opens one page PDF files. For multipage conversions, support for layers, custom rotation and other advanced options, consider purchasing pdf2cad. General requirements: Requires AutoCAD or another Autodesk extension-compatible program to run. Since 1995, PDF FLY has been helping professionals preserve and use their visual information – graphics, reports, forms, charts and more. 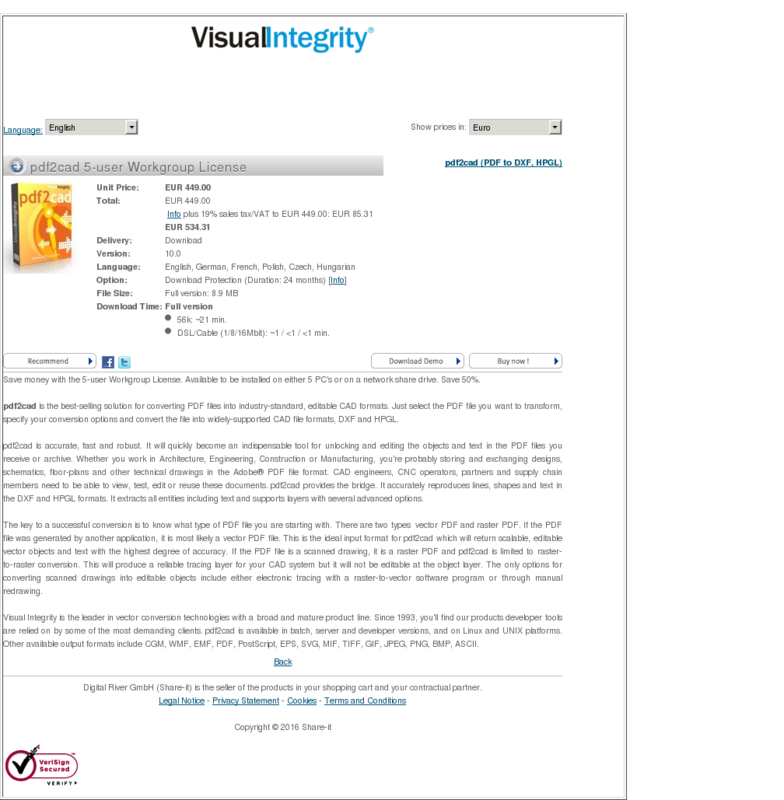 PDF FLY convert these PDF, PostScript and EPS files into other formats while ensuring an accurate visual reproduction. For customers large and small around the world and across industries, PDF FLY saves time and quality while enabling new workflows. PDF FLY converts specified files or entire directories, It can also be used with a watch folder. It’s easy and fast. Try it today free for 30-days! Since 1995, Visual Integrity has been helping professionals preserve and use their visual information – graphics, reports, forms, charts and more. META FLY converts WMF and EMF files into other formats while ensuring an accurate visual reproduction. For customers large and small around the world and across industries, META FLY saves time and quality while enabling new workflows. META FLY supports batch operations. It converts specified files or entire directories, It can also be used with a watch folder. It’s easy and fast. Try it today free for 30-days!